Prime Minister Narendra Modi sank his finance minister's plans to strip powers from the Reserve Bank of India (RBI) last week, sources told Reuters, evidence of a new-found respect for the bank's governor and a recognition that Modi needs his calming influence on markets. When Modi came to power just under a year ago, the position of central bank boss Raghuram Rajan, an appointee of the outgoing Congress government, looked precarious. Senior members of Modi's Bharatiya Janata Party (BJP) chided Rajan for his tough stance on interest rates, which threatened the Prime Minister's pledge to reboot economic growth, and the governor in turn cautioned the government against putting too much faith in exports through its 'Make in India' policy. But when Finance Minister Arun Jaitley, one of Modi's closest allies, dropped plans on Thursday to remove the bank's authority to regulate the government bond market and manage public debt, a senior government source who was privy to discussions said the decision "came from the very top". 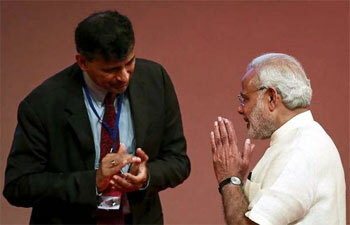 A senior BJP figure confirmed that Modi had intervened on Rajan's behalf. The prime minister's office and the finance minister did not respond to requests for comment. Jaitley now intends to consult the RBI and come up with a detailed roadmap on the issue, a process that could take at least a year, officials say. There were signs last month of the changing dynamics in the relationship between 52-year-old Rajan and Modi, 64, when the prime minister publicly praised Rajan for "perfectly" explaining complex economic issues to him in regular one-on-one meetings. His intervention last week was hard evidence. "The Ministry of Finance's reversal on stripping this power from the RBI reflects the significant influence of the central bank governor," said Kilbinder Dosanjh, a director at the Eurasia Group consultancy. That influence owes much to the reputation of Rajan, a former chief economist of the International Monetary Fund (IMF), and the institution he runs. "We need to be careful while handling the RBI, as it is a proven institution in a country which is ridden with imperfect institutions," said Indira Rajaraman, an economist who is also one of the directors of the RBI's central board and had criticised the finance ministry's plan as hasty and inconsistent. India also needs to consider the impact on investors, who also see the RBI in the same favourable light. Foreign investors have already been irked by the Indian tax department's attempts to claw back tax it says is owed on years of previously untaxed gains, which prompted a sell-off in India's share and bond markets. And with poor monsoon rains in prospect and higher US interest rates looming, New Delhi was reluctant to spook investors further by clipping the bank's wings, said the government source. "Nobody wants to upset the apple cart," said the government source.